#9118 NEW Jesus had no other proof of His legitimacy than He Himself. He never wrote a book, commanded no army, had no political office, and no possessions. 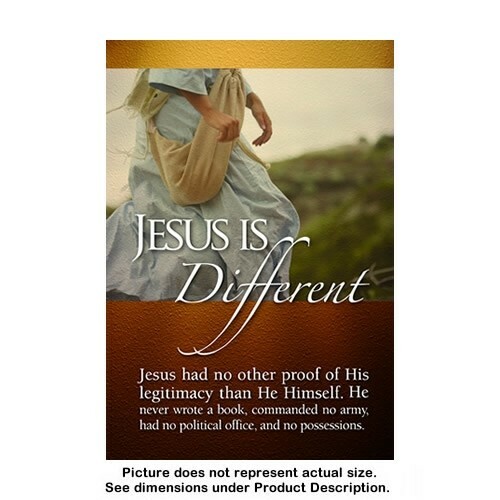 Jesus had no other proof of His legitimacy than He Himself. He never wrote a book, commanded no army, had no political office and no possessions. Almost 2,000 years ago, He traveled within an area of more or less a hundred and fifty kilometers of His hometown of Nazareth, and yet His name is still well-known today. Jesus was completely humble, and yet His being radiated unconquerable authority. Many scholars attempted to make Him stumble through trick questions, but His simple answers and parables speak of an incomparable wisdom that surpassed that of all His contemporaries. All the riches of the world were at His disposal, and yet He renounced them. He firmly resisted all attempts to corrupt Him. He did not let Himself be deceived by honor and flattery. As the Creator of the universe, He lived humbly as a servant of His creatures. Jesus Himself founded no party or organization, and yet His ideas form the basis of countless orders, universities, research facilities and churches. He strictly refused to use violence or to force anyone, and yet He conquered the hearts of millions of people. He did not leave any philosophical textbooks or autobiographical works, and yet there is no other person in world history about whose life more people know than Jesus Christ. The story of His life—the Gospels—is the most frequently printed text in world history. Nobody had as many works written about Him as He did. Jesus Christ painted no pictures and created no new style, and yet He inspired as no other innumerable artists, musicians, architects and sculptors in their work. As no other person, He motivated scientists in their research and discoveries. His ethical values and standards form the basis of education and jurisprudence till today in most countries of the world. No one changed the lives of so many people as drastically as Jesus. He made peace-loving people out of terrorists, and stable people out of addicts; He gave hope to the desperate, and out of failures He built His invisible kingdom on earth. The ingenuity of Jesus Christ was apparent to all who saw and heard Him. Most important personalities fade in time in history books. Jesus, on the other hand, is still the subject of thousands of books and incomparable media controversies. A majority of these arguments is connected with radical claims which Jesus Himself made—claims that amazed His adherents as well as His enemies. He claimed to be the Son of God, to rule over the supernatural world, to heal diseases and forgive sins. And He could prove all this in practice and before witnesses. What does this mean to us? It says that “...God has given us eternal life, and this life is in His Son. Whoever has the Son has life; whoever does not have the Son of God does not have life” (1 John 5:11-12, NIV). And these very unique claims of Jesus were the reason that the Roman authorities and the Jewish hierarchy saw Him as a threat. He was executed on a cross as a blasphemer, but on the third day He rose from the dead. “Jesus Christ, the Righteous One...is the atoning sacrifice for our sins, and not only for ours but also for the sins of the whole world” (1 John 2:1-2). Despite His position as an outsider without any legitimation, Jesus changed the world for the next 20 centuries in a mere three years. “Verily, verily, I say unto you, He that believeth on me hath everlasting life,” said Jesus, and this still applies today.